Here at New England Bites we've made a New Year's resolution - visit more new restaurants. So for our first review of the year, we broke our resolution ... sort of. We recently visited Tito's Cantina, a restaurant we've been to before but have never "officially" reviewed. 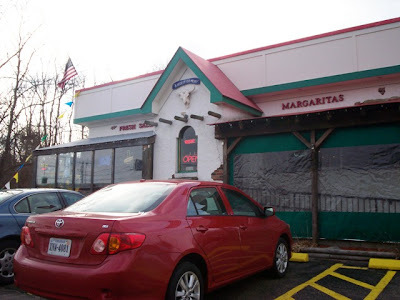 So when Laura had to satisfy her constant craving for Mexican cuisine, off we went to review the Seekonk Tito's. We arrived, under threat of a snowy sky, at around 12:45 p.m. We were told to seat ourselves and chose a window booth with a nice view. This place is so cute. 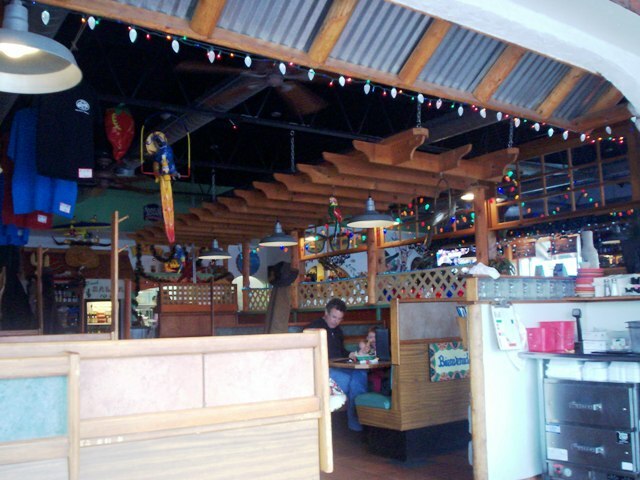 Bright with red, yellow, and orange colors surrounding the wooden booths and tables, the walls were loaded with Mexican symbols. As we read the busy menu our waitress Ali came over to bring us some tortilla chips and salsa and take our drink order. We got two Diet Cokes. Laura and I had looked over their menu online and knew just what we wanted. Tito's has a great menu with all your spicy favorites. 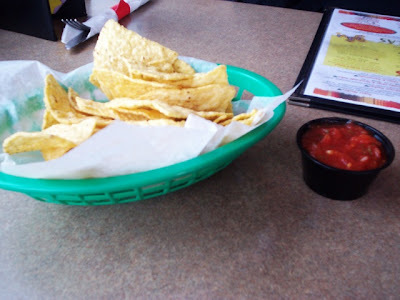 They have the usual appetizers like poppers, fingers, and wings, plus Mexican apps. like hot tamales, chili rellenos, and chili con queso. 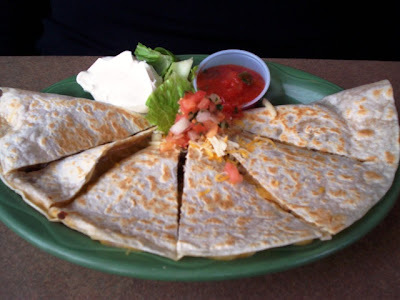 Plus they have all manner of soups (black bean, chili, gazpacho), salads, quesadillas, chimichangas, burritos, fajitas, enchiladas, and tacos. They also have nachos, burgers, and every kind of combination plate. They even have desserts like fried ice cream, flan, and key lime pie. 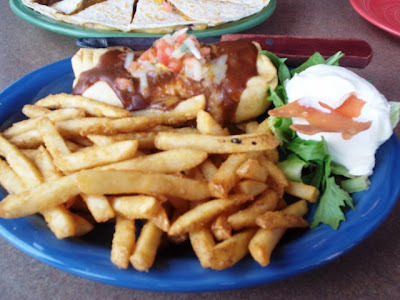 We decided to share a BBQ pork quesadilla and a chicken mole chimichanga. The pork dish came with sour cream and salsa and the chimmy dish came with Mexican rice and salad. Not being rice fans, we traded it for fries. We couldn't wait to try the chicken mole. We've never had mole sauce before and were dying to try it. While we waited for our meals to arrive, Laura went to view the ladies' room and reported back that it was clean and cutely decorated. Ali returned with our dishes and they were beautifully presented. We each placed a wedge of quesadilla and piece of chimmy on our plates. The BBQ pork was tender, sweet, and tangy in its folded tortilla packet. We both found it delicious. Laura was the first to try the chicken mole. Hmm ... "Try this", she said. The first thing I noticed was that they had used chicken thigh. This was a problem for us because we don't care for dark meat. Then there was the mole sauce. It kind of tasted like smashed refried beans which is also not a favorite of ours. Oh, what to do? We really disliked it enough to not being able to eat it. It wasn't Tito's fault. It was strictly personal taste. So we called Ali over to explain to her our problem. She informed us that of every chicken dish on the menu, ours was the only one with dark meat chicken. So she took it back to the kitchen and returned to tell us that we could pick something else. We decided to but also wanted to pay for it as this wasn't their fault. But she said we would only be charged for the fries (which we had exchanged) and our new choice. Isn't that wonderful customer service? 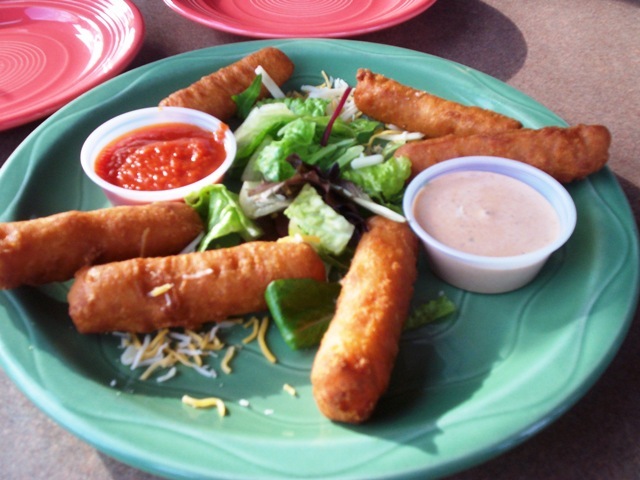 So we chose an order of Spicy Tortilla Jumpin' Jacks which are like Mexican cheese sticks coated with tortilla chips. They were hot and spicy and fantastic. We left $ 28 (with a 20% tip for Ali who was great) and made our way out into the cold and dreary weather. Bye Tito's! See you soon! 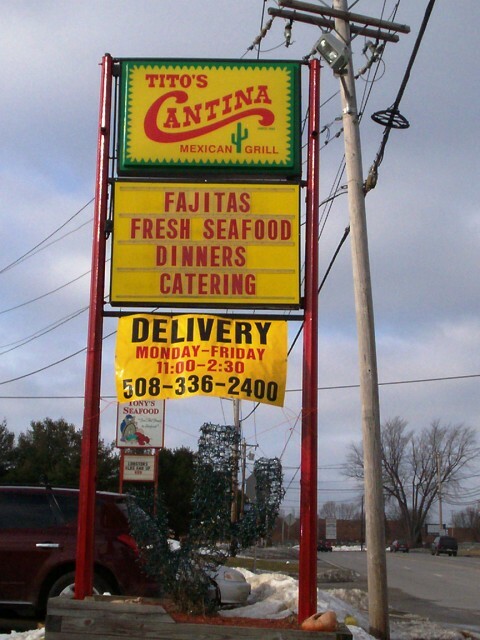 The Tito's Cantina in Seekonk is open from 11:30 a.m. to 10 p.m. Monday through Saturday, and 12-9 p.m. Sunday. The cantina/bar is open until 12 a.m. For the Middletown hours, please visit Titos.com.